We’d love your help. Let us know what’s wrong with this preview of Second Lives by P.D. Cacek. When four patients unexpectedly wake after being declared dead, their families are ecstatic and the word “miracle” begins to be whispered throughout the hospital. But the jubilation is short lived when the patients don’t respond to their names and insist they are different people. It is suggested all four are suffering from fugue states until one of the doctors recognizes When four patients unexpectedly wake after being declared dead, their families are ecstatic and the word “miracle” begins to be whispered throughout the hospital. But the jubilation is short lived when the patients don’t respond to their names and insist they are different people. It is suggested all four are suffering from fugue states until one of the doctors recognizes a name and verifies that he not only knew the girl but was there when she died in 1992. It soon becomes obvious that the bodies of the four patients are now inhabited by the souls of people long dead. To ask other readers questions about Second Lives, please sign up. Award-winning writer P.D. Cacek delivers a full-length novel based on reincarnation that is very much character, rather than plot, driven with an interesting and memorable cast. It explores issues of life and death and the effects of each on families and the wider community. Having just lost someone close to me I could relate to the emotive scenes and felt they were beautiful and sensitively done. It's a well written, compulsive and thought-provoking read which blurs the line between myth and re Award-winning writer P.D. Cacek delivers a full-length novel based on reincarnation that is very much character, rather than plot, driven with an interesting and memorable cast. It explores issues of life and death and the effects of each on families and the wider community. Having just lost someone close to me I could relate to the emotive scenes and felt they were beautiful and sensitively done. It's a well written, compulsive and thought-provoking read which blurs the line between myth and reality making us question philosophical principles of why we are here. Second Lives is a surprisingly superb novel which manages to be rather difficult to classify. The best definition is a cross between speculative fiction, literary fiction and horror with some interesting supernatural elements thrown in for good measure. The writing and flow work perfectly to keep you grasping at straws and wondering what would likely come next. It's a unique story and one that you'll enjoy provided you can let go and suspend your disbelief. I look forward to picking up more of her work. Each chapter was like a short story unto itself. I need to think about this one. Full review to come...stay tuned! Thank you so much to, Flame Tree Press, for providing me with a copy to read and review. I appreciate the opportunity! I'm not sure if it was because of the author or because of the cover, but I was expecting horror here. So, if you were thinking along the same lines, this is supernatural, but not horror. It's a mix of so incredibly sad and so incredibly hopeful. Cacek has a clear gift for characterization and, I warn you, each and every main character has a heartbreaking story line. Tears were shed. But the story lines were so very compelling and I had so much hope for all of them! I loved this. It was completely I'm not sure if it was because of the author or because of the cover, but I was expecting horror here. So, if you were thinking along the same lines, this is supernatural, but not horror. I loved this. It was completely unexpected and completely wonderful. This novel is a spellbinding and original exploration of reincarnation in which lives that were cut short return from the dead, not as newborns and not with new lives, but in the bodies of the recently deceased. Imagine losing a loved one, but not being able to lay them to rest because a stranger now inhabits their body. Imagine having lost a loved one years ago but finding out they are now alive in a body that you don't recognize. Now imagine being that person, perhaps a child that was run down This novel is a spellbinding and original exploration of reincarnation in which lives that were cut short return from the dead, not as newborns and not with new lives, but in the bodies of the recently deceased. Imagine losing a loved one, but not being able to lay them to rest because a stranger now inhabits their body. Imagine having lost a loved one years ago but finding out they are now alive in a body that you don't recognize. Now imagine being that person, perhaps a child that was run down in the street waking up in the body of an elderly dying man. This is the wondrous concept brought to life by P.D. Casek. Second Lives has a really interesting synopsis, so I knew I wanted to check it out when I heard about it. I read about 80 pages, and nothing happened to catch my interest. There are 8 characters with different chapters, and some are in different timelines, and it didn't feel like a cohesive story. Maybe it all links together later on, but I didn't care about any of the characters enough to keep going. A very emotional roller coaster of a book! I went in expecting this to be a horror or supernatural book and I'm glad I didn't read any other reviews or the description because it blew me away. It is so much more. Emotional. Funny. Sad. Poignant. I found myself smiling as I finished it, knowing I'd just read something important. Need to sleep on it! Ok... that COVER is SOOO creepy! I LOVE IT! I was so intrigued by the subject of this book... and totally believe in reincarnation. I was totally on board with this book! Few patients wake up in the hospital after they flatlined and wake up some else. Yes I know CREEPY! Possessed by someone else for no reason. Second Lives explores the concept behind reincarnation through 4 cases. What happens when one soul leaves a body and another enters? It looks like the same person... but it is not at all. Thi Ok... that COVER is SOOO creepy! I LOVE IT! Second Lives explores the concept behind reincarnation through 4 cases. What happens when one soul leaves a body and another enters? It looks like the same person... but it is not at all. This concept to me is absolutely fascinating. I was super hyped to read this book but felt that the story really didn't end up going anywhere. I wish that it would have focused more on one case instead of the four cases. I think more detail of explaining where the souls went and why etc would have added. lot more depth to the story. Overall, decent read for me. Thank you so much to Netgalley and Flame Tree Press for the arc in exchange for an honest review. A frightened little boy killed in 1956 cries out for his mother from the body of an eighty-one year old Alzheimer's patient. The soul of a spinster killed in a Suffragette rally wakes in the body of a new mother. An Orthodox Jew, murdered in 1922, opens the eyes of a man who just committed suicide and a teenage girl wakes to discover she's now in the body of a forty-five year old woman. They are completely alone, displaced in bodies that are not their own, and terrified. All must find immense bravery within themselves to transition into their new lives. The tagline (and cover) grabbed me on this one, I have read before reincarnation books but this is something different. Each chapter the character's name and timeline is at the top, we then meet the characters, those in their original time period, the lead up to their deaths and those who "die" and are re inhabited. By the time you meet all the characters you are about half way through so I wasn't sure where the book was going to go? The author, in my opinion, has created a fresh new and frightening story, not in a horror sense but more of a OMG what if, can you imagine and what would you do, humanity rocked. Your loved one dies and then comes back, you are ecstatic but the person who has come back isn't your loved one but someone who has lived previously and now inhabits your loved ones body, can you imagine! Cacek comes at the story in many angles, the hospital/medical professionals, the people who are replaced? (I don't know what word best applies to the phenomena, travelers? ), the travelers themselves and the loved ones dealing with these new people in their loved ones bodies. It looks at humanity, how ordinary people deal with having this emotional trauma flung onto them and those who have been dead and now alive again albeit in different bodies, readjusting, adapting. The timeline shift for the characters is really interesting, imagine living in the early 19oo's - women fighting for basic rights to then being flung into modern day living. Indoor plumbing, flesh on show, speaking when you want rather than when society dictates when a woman should (this is relevant to one character only). Religious beliefs, coming back into the body of someone living a life at odds with your beliefs, a child into an elderly gentleman's body who has Alzheimer's, a teen into an older woman's body with physical limitations. The book doesn't explore these themes in huge depth as it is more about the individuals but it does get the reader thinking, what if? How would you cope? As the traveler, as the family? Whilst the story itself and characters are fascinating I think the book prompts a lot of in depth thought and musing from the reader, you can't help but imagine being in that position as you read the scenes. How would you react? I didn't want to put it down to see how each situation would play out. A bit of an emotive read at parts as death, grief, suicide, murder, acceptance and loss are huge themes integral to the story. When you have so many characters and time jumps you can easily be put off in books or find it hard going, Cacek does it effortlessly and I had no problems following it, I thought it was really well done. My only complaint would have been to have more! I would have loved the book to go on and sure they say an author is doing their job if they leave the reader wanting more (not hanging, I hate that). 4/5 for me this time, this is my first dance with this author, not sure what their other books are like but I plan to check them out for sure! In P. D. Cacek’s sixth novel, Second Lives, many lives are disrupted by death: the ones who leave, the ones who are left behind, and the ones who come back. With these second lives, come second chances. How the characters deal with these is one of the main themes of this book. In parts one through three, we are introduced to the inner thoughts and outer lives of the eight characters whose paths will intersect on August 24, 2017. The writing flows easily as we learn about Timmy, six-years-old from 1956 who watches Howdy Doody, and has just learned he will soon be a big brother. Then there’s Henry and Nora, a couple in their 80s dealing with Henry’s Alzheimer’s; and Elisabeth, a self described spinster from 1914, caught in the wrong place at the wrong time. P. D. Cacek is a very experienced writer and it shows in this book. The winner and nominee of several Bram Stoker Awards tells a story that allows the reader to suspend reality and get pulled into the story. That’s not an easy thing for this reader. As in all books, there are a couple things which could have been left out or added in. For example, it might not be necessary to address how a hospital is or is not legally liable when trying to explain the unexplainable—reincarnation, soul transportation. The description of this book is long so there is no reason for me to rehash it. If you haven't read it, GOOD! Don't! Take the title and the recommend and dive in. I couldn't devour this novel fast enough. And a novel novel it is. I can't recall reading anything quite like it. Cacek took a tough subject (life and death) and looked at it from a brand new perspective. She created a multitude of characters that were separate and distinct and wholly their own. And while I did have questions about some people and things, I was willing to overlook them because I felt it adding more information might gum up the story. The story is nicely broken up into easy to follow sections. By the third section, I was snatching tissues to wipe my eyes; soon I was beginning to weep. I realized I had to stop or I couldn't finish the book, but finish I did through blurry eyes. At first glance, Second Lives may be considered a horror story but it is so much more. Four people from differing walks of life die. Yet, they are somehow miraculously brought back from the brink of death, long after such a thing should have been possible. Are they really though, as each person claiming to be someone else, with no memory of the person whose body they now inhabit? The more you read, the story transmutes into one of kindness, compassion, and understanding. The story begins in the At first glance, Second Lives may be considered a horror story but it is so much more. Four people from differing walks of life die. Yet, they are somehow miraculously brought back from the brink of death, long after such a thing should have been possible. Are they really though, as each person claiming to be someone else, with no memory of the person whose body they now inhabit? The more you read, the story transmutes into one of kindness, compassion, and understanding. The story begins in the past, following four people's lives...and deaths: Elisabeth Wyman, died in 1914 attending a woman's suffragette protest, Timothy O'Neal, in a hit and run accident in 1956, Aryeh Rosenberg, murdered in his watch shop in 1922, and Christine Moore, accidentally falling off her high school balcony in 1992. Then we jump to August 24th. These travelers, as they will be later deemed, wake in new bodies: Elisabeth in the body of Sara Cortland, comatose and pregnant but kept alive until her baby reaches term; Timothy in the body of Henry Rollins, a dementia patient whose body is failing him; Aryeh in the body of James Cooper, a paraplegic gay man who decides he can no longer deal with the demands of life and commits suicide; and Helen Harmon, who chose cardiac surgery so that she can get on with her life. While at first, it was challenging to follow so many different characters and timelines, they eventually blend. Dying is easy .... the hard part is the situation for those left behind! This forms the crux of this wonderful novel. In this case, however, not only dealing with the grief and loss of your loved one... but, trying to deal with the inexplicable presence of another soul in their body. It's been a long time since I've read a fantasy that is so poignant . The reader experiences a wide range of emotions ... pitty, sadness, joy, heart-warming and rending, tearfulness, and lastly wonder. The major pre Dying is easy .... the hard part is the situation for those left behind! This forms the crux of this wonderful novel. In this case, however, not only dealing with the grief and loss of your loved one... but, trying to deal with the inexplicable presence of another soul in their body. Dr Stanton, the cardiac surgeon comes to The Fab Four meeting with a flash drive containing his research into the past history of all the Travelers. This is spurned onward by his fortuitous situation in which he actually knew Christine in high school ... and her apparent ravings about being someone other than Helen ring true. He doesn't believe that all four patients are experiencing a fugue state. Imagine you have steeled yourself to say goodbye to your loved one. They are dying and there is no chance of survival. The machines flat line. Everyone is subdued and then they start breathing again. Is this a miracle? The doctors certainly struggle to understand it. Sorrow turns to joy and then to confusion. The body is your loved one but who is inhabiting it? This story looks at the lives of just a handful of people. This is not an epidemic, nor a zombie invasion. Just a handful of people in on Imagine you have steeled yourself to say goodbye to your loved one. They are dying and there is no chance of survival. The machines flat line. Everyone is subdued and then they start breathing again. Is this a miracle? The doctors certainly struggle to understand it. Sorrow turns to joy and then to confusion. The body is your loved one but who is inhabiting it? This story looks at the lives of just a handful of people. This is not an epidemic, nor a zombie invasion. Just a handful of people in one hospital who come back to life as different people. I like the idea that the author focused on just a few families in detail and didn’t try to encompass a world event. The beginning of this book is quite difficult. The author devotes a series of chapters to individuals – those who will die and those who will return in their bodies. This made the beginning rather confusing. You are suddenly faced with a whole load of disconnected characters and lives with no story to link them. About a third of the way through the author does start to pull the threads together. I did struggle with the start of this book as it was so disjointed. Having completed the story I can see why the author chose to form the book in this manner but for the reader it was rather confusing. As a reader you may wish to make notes on the characters as they are introduced – it will definitely help later. Despite this confusing start I enjoyed this book. Once it got into its stride I struggled to put it down. There are some wonderful characters and situations – I won’t go into detail, you need to read it for yourself. There were people I liked and didn’t like. The author drew everything together well at the end and I felt that the book was well concluded. There are no loose ends. I will warn you, however, that you don’t receive an explanation. For some people this could be a major issue – why did this happen, how did it happen? We don’t know. If you need to know these things then don’t read this as it will frustrate you. I enjoyed not having the lengthy explanations as it allowed me to focus on the people involved. An unusual book which I enjoyed reading. This is the first I have read by the author, but thanks to the extensive back catalogue the company has and the interview at the front of the book (one of my favourite things! )I will be hunting down her other works. ‘Second Lives’ is such a great story, it has a slow build, delibersately structured so tha you get to know the characters and feel that sense of loss when they die. The story is told in alternating chapters so there is the person who dies, then the person who is about to die. This means 8 chapters have to be read before the story lines merge , and could have been confusing of not for the clear and consistent tone that P.D Cacek uses. You get to know Henry, Helen, Sara and Jamie before Timmy, Crissy, Elizabeth and Arveh take over and it’s such a subtle, well nuanced tale that is a little creepy but what I loved so much is that there is no explanation to what happens. No clearcut ‘lightning strike’ moment of this is how the souls came back, it is a fluke, a one off from this narrative perspective and they way it is dealt with is quite beautiful. How far would you go to have your loved one back ? Would you be willing to accept someone in their body? The challenges each of the ‘Travelers’ families have is in dealing with their very unique situation and not all of them embrace this ‘returned’ loved one. Here lies the humanity of this tale, and the contrasts could not be more varied between the souls and who they inhabit. It is a mournful as the sigh of wind through the trees and whilst there are poignant moments of sadness, ‘Second Lives’ is ultimately about hope, the human spirit and love. P. D. Cacek rocks! SECOND LIVES is an extraordinarily compelling novel which I classify as horror, science fiction, and literary fiction. The premise seems simple enough on the surface: three patients in one hospital in California die on the same date--August 24. That's not odd. In a large hospital, that fact might be fairly common. A fourth man dies after a swimming pool drowning. However, what is odd, even impossible, is that all four patients revive: suddenly, after being declared clinically P. D. Cacek rocks! SECOND LIVES is an extraordinarily compelling novel which I classify as horror, science fiction, and literary fiction. The premise seems simple enough on the surface: three patients in one hospital in California die on the same date--August 24. That's not odd. In a large hospital, that fact might be fairly common. A fourth man dies after a swimming pool drowning. However, what is odd, even impossible, is that all four patients revive: suddenly, after being declared clinically dead. All four are at first diagnosed with retrograde amnesia: they have no memory, of course, of dying, nor even of their previous lives. The attending psychiatrist believes this may be a temporary condition, but it's not: apparently all four of those individuals are gone, permanently. The "occupants" of these four formerly dead, now living bodies are others. The psychiatrist, baffled and befuddled, eventually comes to accept their nature, and terms them "travelers." Apparently, there have been some other instances. All four individuals themselves previously died (two deaths due to violent confrontation, two due to accidents), none of them recently, and now find themselves ensconced in "new" physiques. Both the "newly returned" and the surviving families of three of the patients are at a loss as to how to react: their loved ones died, now they're alive, except they're not, this is somebody else. Author P. D. Cacek approaches this baffling conundrum marvellously, giving really four different scenarios of working out these situations. She totally puts all the characters through their paces, and if we don't always admire some of them, certainly we are given a deep comprehension of their natures. Yes, there's character evolution, too, thankfully. Thank you so much Flame Tree Press for this advanced copy of 'Second Lives' by P.D. Cacek! I first have to say how much I love the cover design of this book. Aesthetically it is gorgeous and that's what first made me want to read it. Next, I would say I would rather give a 3.75 ish rating closer to a 4 buy not quite a 4. This story takes a while to kickstart. There were a few parts that I felt were completely unnecessary as far as character building goes. Some of the parts felt dragged out a littl Thank you so much Flame Tree Press for this advanced copy of 'Second Lives' by P.D. Cacek! Next, I would say I would rather give a 3.75 ish rating closer to a 4 buy not quite a 4. This story takes a while to kickstart. There were a few parts that I felt were completely unnecessary as far as character building goes. Some of the parts felt dragged out a little. I know some people may feel annoyed by the different types of representation in this novel, I personally felt that they were handled fairly well. The writing was well done, very easy to read and comprehend everything. The ending(s) of each character...might have been a little cheesy, but when you consider the subject matter, I let that slide. Not everything has to be realistic to be good. Some cry moments, some sad moments, some angry moments...this book will make you question what you might do in the same situation. The families and close friends of 4 people think they have witnessed a ¨miracle¨ when their loved ones, who have been been declared dead, regain consciousness. They begin to breathe, see, hear and talk. However, the ¨miracles¨ prove less than miraculous when the families realize their loved one, now alive, does not recognize them, or their past. They do not even respond to their own names. After examining who they claim to be, these 4 patients are now possessed with the souls of people who have been dead many years. The hospital psychiatrist claims it as proof of the ¨transmigration of the soul¨ and urges the families to accept and help these displaced souls and help them get use to the new world they have been placed in. Fresh and creative, this is an extraordinarily exciting and compelling story of second chances. The characters are cleverly developed, each dealing with the transmigration in their own way. How the families accept it is powerful and realistic. Intelligent, powerful and a great study of character. Fantastic and original, character driven and exciting, this is compelling from start to finish. Looking forward to more from Cacek! Thank you to FlameTree Press, NetGalley and P.D. Cacek for this e-book ARC for a fair and honest review. I'm afraid this is a DNF for me. I read the first chapter and really enjoyed what I read. Then, I kept reading all the way to the end of Part One but had to stop. There are TOO many characters with TOO many stories. It felt like I was reading a collection of short stories about a bunch of different people from different time periods, yet nothing was happening to the main storyline. I know that probably makes no sense because each chapter contained a different person's death, so it's obviously pac I'm afraid this is a DNF for me. There are TOO many characters with TOO many stories. It felt like I was reading a collection of short stories about a bunch of different people from different time periods, yet nothing was happening to the main storyline. I know that probably makes no sense because each chapter contained a different person's death, so it's obviously packed with story... but as a novel, this wasn't working for me. It's too disconnected. But what's worse is that there were too many characters to have time to care about any of them. I realise there's probably a point where everything and everyone comes together, but I wasn't invested in anyone enough to keep going. SECOND LIVES by P.D. Cacek is one of those rare books that you read.. in utter fascination! The story is about eight very different folks from various time frames and their deaths. Bizarrely, upon death.. four of the folks are declared legally dead on the same day.. and their bodies suddenly come back to life.. but, they are not the same souls. Those that have been deceased for a number of years.. awaken and find themselves inhabiting another person's body. I found this story to be a fantastic t SECOND LIVES by P.D. Cacek is one of those rare books that you read.. in utter fascination! The story is about eight very different folks from various time frames and their deaths. Bizarrely, upon death.. four of the folks are declared legally dead on the same day.. and their bodies suddenly come back to life.. but, they are not the same souls. Those that have been deceased for a number of years.. awaken and find themselves inhabiting another person's body. I found this story to be a fantastic think piece! One of those rare stories that I know I will re-read again! The characters are so well fleshed out.. and one becomes entwined in each persons journey of death and reanimation. 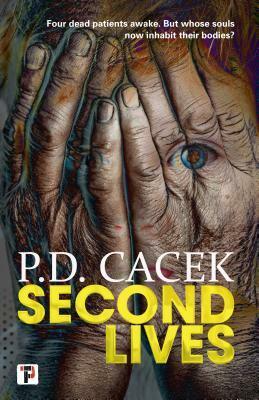 I received an ARC of Second Lives by P. D. Cacek from Flame Tree Press for an honest review. A little boy who was struck and killed by a car in 1956 wakes up in the body of an 81 year old Alzheimer’s patient. A spinster who was killed at a suffragette rally in 1914 now inhabits the body of a new mother. An Orthodox Jew who was murdered in 1922 wakes up in the body of a paraplegic who just committed suicide. A teenage girl who died in 1992 wakes to discover she’s now in the body I received an ARC of Second Lives by P. D. Cacek from Flame Tree Press for an honest review. A little boy who was struck and killed by a car in 1956 wakes up in the body of an 81 year old Alzheimer’s patient. A spinster who was killed at a suffragette rally in 1914 now inhabits the body of a new mother. An Orthodox Jew who was murdered in 1922 wakes up in the body of a paraplegic who just committed suicide. A teenage girl who died in 1992 wakes to discover she’s now in the body of a forty-five year old woman. P. D. Cacek does a great job with the back story of all eight characters and an even better job of showing how the four people getting a second chance at life adapt to the new world they are thrust into as well as dealing with the loved ones of the bodies they now inhabit. This isn't quite what I was expecting, but it is certainly a most extraordinary book. The cover makes it look to be a somewhat scary story, but I found it played on other emotions and brought me close to tears several times. Initially I thought I might lose track of all the different characters, but they're all so well rounded out and individual that there wasn't a problem, especially after pairs of story lines merged. You really get to feel for these characters and the situations they're in. Dif This isn't quite what I was expecting, but it is certainly a most extraordinary book. The cover makes it look to be a somewhat scary story, but I found it played on other emotions and brought me close to tears several times. Initially I thought I might lose track of all the different characters, but they're all so well rounded out and individual that there wasn't a problem, especially after pairs of story lines merged. You really get to feel for these characters and the situations they're in. Difficult, emotional situations which all have different outcomes. This one took me by surprise, and is likely to stay with me for quite a while. I loved this novel. It's powerful, uplifting, and in several places, a tearjerker. Make sure you have a box of tissues handy before you start it. I enjoyed P.D. Cacek's tale, and I look forward to reading more of her work. I give this novel a solid 4 stars. Disclaimer: I received an advance reading copy of the novel from Flame Tree Press in exchange for an honest review. I received no money or any other I loved this novel. It's powerful, uplifting, and in several places, a tearjerker. Make sure you have a box of tissues handy before you start it. I had read some shorts of Cacek's before, this was the first novel. Second Lives follows the tragic end of four people and their re-birth in recently deceased people. The book does a great job of giving the backstory, but the true heart is in how their love ones cope. Imagining the body of your loved one carrying someone else's soul is difficult, and Cacek does an amazing job of showing the different ways the characters cope. I received an advance copy of this book in exchange for an honest r I had read some shorts of Cacek's before, this was the first novel. Second Lives follows the tragic end of four people and their re-birth in recently deceased people. The book does a great job of giving the backstory, but the true heart is in how their love ones cope. Imagining the body of your loved one carrying someone else's soul is difficult, and Cacek does an amazing job of showing the different ways the characters cope. I'm DNFing this at 30%. My most sincere apologies to the author and to Flametree who kindly approved me for this book on Netgalley, but ultimately I just can't connect with the story. The writing is great, the author is very talented, but as of 30%, I just haven't connected and I'm struggling to want to go further. The synopsis was very intriguing and the cover artwork is top notch, but this is just a case of wrong reader for the story! Occasionally credited as Patricia D. Cacek. Patricia Diana Joy Anne Cacek (December 22, 1951, Hollywood, California) is an American author, mostly of horror novels. She graduated with a B.A in Creative Writing from California State University, Long Beach in 1975.